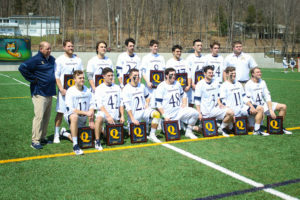 On what may be the nicest Saturday of the year so far in terms of weather, the Quinnipiac men’s lacrosse team defeated Canisius 19-14 in a Metro Atlantic Athletic Conference (MAAC) clash on its Senior Day. The Bobcats (7-5, 4-0 MAAC) were caught in a back and forth tilt until they went on a 6-0 run in the second quarter. The run saw multiple goals from freshman attack Jake Tomsik and senior midfielder Ryan Corcoran. The Bobcats used 18 substitutes compared to the Golden Griffins (5-7, 2-2 MAAC) who used 11. The Bobcats’ subs helped to win the ground ball battle which is a key to winning games, according to Fekete. A key to giving the energy and jump to the subs comes from the Bobcats top line of Tomsik, junior attack Foster Cuomo and junior attack Mike Fletcher. The trio combined for 11 goals and 15 points on the afternoon. The Golden Griffins also had their top players play as such. Sophomore attack Mathieu Boissonneault, senior attack Connor Kearnan and senior midfielder Steven Coss combined for eight goals and 14 points on the day. Things got interesting in the fourth quarter as Canisius caught fire, rifling off seven goals to Quinnipiac’s four, but the Bobcats managed to hold on. The Bobcats are losing 14 seniors to graduation at the conclusion of the season, which is something that helped motivate the team to win, resulting in the team scoring a new season-high in goals. 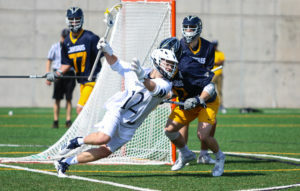 The goal total of 19 surpassed that from earlier in the season when they defeated the New Jersey Institute of Technology 18-6. This senior class has accomplished a lot in their time at Quinnipiac, including winning a MAAC Championship back in 2016. The Bobcats look ahead to another MAAC matchup at Monmouth on Saturday, April 14.